You can substantially reduce your income tax by saving for retirement, owning a home, or sending your kids to college and it isn't all that difficult. These are things you're probably doing anyway. You might as well get some tax benefit out of them, right? We'll assume in these scenarios that you're married and planning to file a joint tax return. You and your spouse collectively earn $125,000 a year in wages or salary. You have three kids: two in college and one in high school. Let's say that you and your spouse each tuck away $10,000 in your 401(k) retirement savings plans. This reduces your taxable income by $20,000 so now you're only taxed on $105,000 of what you earn and you're doing something to provide for your retirement as well. $105,000 becomes your adjusted gross income as well because you can claim deduct contributions to your savings plan "above the line" without itemizing or giving up your standard deduction. It's considered an adjustment to income. Reducing your AGI can help you qualify for other tax breaks as well. Some are not available to taxpayers with AGIs or modified adjusted gross incomes above certain limits. For example, some taxpayers might also be eligible for the Saver's Tax Credit which is equal to up to 50 percent of your retirement contributions—in addition to the deduction you're taking to reduce your AGI. But this credit is subject to phase-outs. The 50-percent tax break is only available to married taxpayers with a joint AGI of $38,000 or less as of 2018. The percentage then drops as you earn more until it's eliminated entirely for taxpayers with joint AGIs of more than $63,000. At $105,000 in remaining income after your retirement contributions, you don't qualify. You and your spouse can actually each contribute up to $18,500 a year to your 401(k) plans as of 2018. We're being modest with the $10,000 figure in this scenario because, after all, you're also putting two kids through college. Owning a house can reduce your taxable income as well if you itemize your deductions. Let's say that you've paid mortgage interest of $5,000 over the course of the year, as well as another $5,000 in real estate taxes. And let's not forget the state income taxes that were withheld from your paychecks. Maybe they totaled $2,500. First, you can claim a $7,500 state and local tax deduction if you itemize—your property taxes plus your state income taxes. This deduction was changed under the terms of the Tax Cuts and Jobs Act, the new tax law that went into effect on Jan. 1, 2018. But at $7,500, you're still within the new limit: $10,000 per tax return in 2018. Now your taxable income has dropped to $97,500. But we're not done yet. You also paid that $5,000 in mortgage interest. That's an itemized deduction as well so you've now reduced your taxable income again by that amount. You're down to $92,500. The TCJA limits this deduction to mortgages of up to $750,000 as of 2018, but if you happened to buy your home before Dec. 31, 2017, you'd still qualify for the old cap which was $1 million. This might sound really good so far but you're actually paying the Internal Revenue Service more than you have to in this scenario. You have a total of $12,500 in itemized deductions: $7,500 plus the $5,000 in mortgage interest. But the standard deduction for those who are married and filing jointly in 2018 is $24,000. That's $11,500 more than what you could deduct if you itemized. You can't claim the standard deduction and itemize, too. It's an either/or option and it only makes sense to itemize if your total itemized deductions exceed the amount you're entitled to claim as a standard deduction. In this case, if you have no other itemized deductions, it would be more advantageous for you to claim the standard deduction. Your taxable income drops to $81,000 if you do, not $92,500, and that's a whole lot better than the $125,000 we started at. 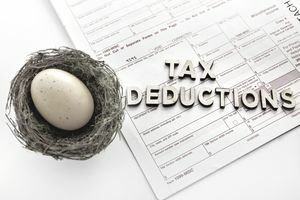 Of course, there are other itemized deductions you might be able to claim as well to increase your overall deductions to more than the $24,000 standard deduction. They include medical and dental expenses, many health insurance premiums, and charitable contributions. Unfortunately, personal exemptions are gone in 2018, at least until the TCJA potentially expires at the end of 2025. As of 2017, you could have reduced your taxable income by another $20,250 by claiming these. Personal exemptions were set at $4,050 per person in 2017 and you could claim one for yourself, your spouse, and each of your three dependent children. This tax perk is off the table, at least temporarily. Two of your children go to college. We'll say that your daughter is a senior at a state university and your son is a freshman at another state university. You have the option of claiming either the Lifetime Learning Credit or the American Opportunity Credit for each of them as of 2018. Maybe you spent $15,000 on your daughter's tuition and $5,000 on your son's tuition for the year. If you claim the Lifetime Learning Credit, it's worth 20 percent of the first $10,000 of tuition expenses you pay for one child up to a maximum credit of $2,000. The American Opportunity Credit is worth up to $2,500 on the first $4,000 of qualifying educational expenses you spend, and this includes course materials as well as tuition. You can't take both the LLC or the AOC for the same student but you can claim one for one child and the other for your other child. Or you can claim either one twice, once for each student. Now here's another catch. These are tax credits which are actually better than tax deductions. Tax credits don't reduce your taxable income. They're applied to and directly reduce your tax bill. We'll say that you've finished your tax return only to realize that you owe the IRS $2,000 after taking all deductions that are available to you. Any combination of these tax credits for higher education would fully eliminate that tax debt but the American Opportunity Credit would work out better for you because 40 percent of this credit is refundable. The Lifetime Learning Credit is nonrefundable. This means it can reduce your federal income tax to zero but not below zero. If you use two American Opportunity Credits at the maximum $2,500 amount each, that's $5,000 in tax credits. You owed $2,000 so now your tax debt is reduced to zero. But 40 percent of the credit is refundable up to $1,000. Refundable credits function just like withholding and other tax payments. Any excess amount above the federal income tax liability is refunded to you by the IRS. So instead of owing the IRS anything, you'll receive a tax refund of $1,000. Forty percent of that $3,000 that was left over after erasing your tax bill works out to $1,200. That's more than the $1,000 cap so you won't be able to claim the last $200 but you've at least come out of the equation with $1,000 you didn't have before. These tax credits are also subject to income phase-outs. The Lifetime Learning Credit is eliminated for joint married filers with modified adjusted gross incomes of $132,000 as of 2018. The American Opportunity Credit is eliminated for married filing jointly taxpayers with MAGIs over $180,000. For many taxpayers, your MAGI is the same as your AGI. Tax rules and laws can change in the blink of an eye so be sure to consult the IRS website for the most up to date federal income tax rates and information. You might also want to consult with a tax professional to see how these tax breaks work for you given your personal circumstances. Do You Understand the Value of Tax Credits?